This blog serves to inform the public about the events and services offered at the Healing Castle in Schochwitz, Germany. Greetings from the newest member of Schochwitz castle! My name is Trâm and perhaps I am the very first Vietnamese workwayer at the castle ever. I've been going to University in Finland for 3 years now and I've taken this advantage to travel within Europe as much as I can before moving back to Asia for good. I would say Germany is definitely one of my favorite countries that I've been to. That was also my main reason for me to pick the country to do my first workaway experience. And taaaadaaaa, I found this Schochwitz castle! I've just arrived at the castle yesterday, so I'm still pretty new to the place and I believe my stay here is gonna be an interesting experience for me. I've been asked why I have chosen to do my volunteer at Schochwitz castle. My friends and family were really surprised with that decision as well and they wished me luck before my leaving. Well, I totally understand their reaction. First of all, I'm not a vegetarian. The idea of being a vegetarian for even more than 3 days scares me a bit as I'm not sure how my body and meat-cravings will deal with that during my stay here. Secondly, I'm not a morning person. Waking up early for classes at Uni (at 7 am) is already a torture to me. Now just imagine yourself waking up 5:45 am. Yes, you know what I am talking about now huh. Thirdly, I don't really meditate back home. I had my very first real meditation session this morning and it was a bit hard for my knees and feet already. You might just tell me to go home now right? No, not yet. But yea, to answer that question why. It's all about trying the niche experience and learning more about wellness and spiritual tourism/retreats which I've heard a lot about. Life is all about trying new things, eh? It is how we enrich our life right. Yes, I was bored living my life with same own daily routines. Also, as I have read about the place, staying at the castle gives one a great opportunity to have deep relaxation and self-reflection. And at the end of the day, I hope to have the ability to hear my inner voice which I have been rather ignorant to listen to, to creating positive changes, to reduce and manage stress and to enhance synergy in my life. I will come back and keep everyone updated about my progress. Yes, I'm very excited to be on this journey and I am very happy to have other 2 fellow workawayers staying at the castle with me and they have been just amazing and super helpful. The sky is grey this morning and the early spring rain is running down in interesting patterns on the castle windows. When the season changes, it unfolds in abundant, beautiful litte white, yellow and purple flowers all around the German town, Schochwitz. Winter is almost past and change is in the air. Over hot coffee and freshly buttered bread, we discussed the power we have as humans to create our lives. One seldom realise the opportunity every second brings to create something beautiful and amazing in your life. I remembered a litte book I found one day while searching for secrets to the laws of nature and the universe. With this opportunity, I would like to share the book with you and wish you the most beautiful and abundant reality, should you wish it. The author, Mr RHJ and the many people who read his little book, claims that it is possible to create anything you want in your life...if you know exactly what it is you want! This is the basis of creating something..the knowing of the exact situation or thing you want. We always dream and wish things but seldom allow ourselves to visualise it in full colour knowing exactly what we want from our life on earth. Do you constantly think about being healthy? What affect different food has on your body? How to maintain health through diet? Well, if you are anything like me then these questions might plague your mind more often than you care to admit. 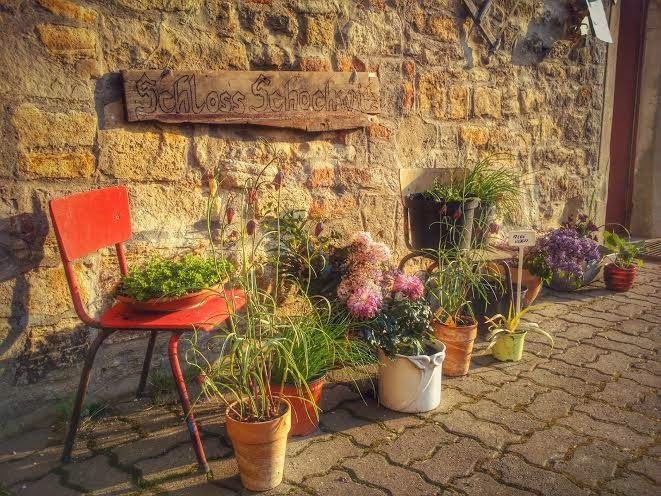 And so began another part of my life's journey on 19th September 2014 when I arrived at Healing Castle Schochwitz ready to absorb village life having spent the last two years in a Metropolis. I started my holistic lifestyle about two years ago and was ready to continue with this journey here at the castle. I had already read that at the healing castle they only served vegetarian food and I was a little bit worried as up until this point I had been following the pretty carnivorous paleolithic diet. However, I figured that as long as I could have eggs a few times a week then I should be a-okay. If you haven't already been able to tell by now, my food intake is really important to me, as I believe (or believed) that health is the relationship between food and your body and to maintain good health you have to eat the right foods (right foods - correctness, being perfect - hmm?). So with a bit of guidance, and a lot of googling, I went from a wheat-free diet, to a gluten/dairy free diet, to the paleolithic diet, to the Candida diet back to the paleolithic diet and then to the GAPS diet. My food intake seemed to mirror the shape of an hour-glass with the most restrictive point being whilst I followed the Candida diet, and it really was restrictive! Now, of course, at no point in the last two years have I ever been on a "diet". I was just eliminating foods that were detrimental to my health. The more I read up on gluten, dairy, and sugar, the more that I was convinced that I was benefiting my health, and I certainly saw the benefits. I especially noticed the change when I went on the Candida (low sugar) diet as I was able to think more clearly, my sleep cycle improved and the back pain that had crippled me since I was a child went to its lowest intensity. What more proof did I need? It was not all smooth sailing however, as there were points whilst following these various diets where I had no energy and really was not able to maintain a big city lifestyle. Nevertheless, I persevered because the benefits were great! Ingrid, the spiritual extraordinaire that she is, started to quiz me about my gluten-freeness within the first few days of me arriving at the castle. She had experienced other volunteers this summer who also had restricted diets and they were constantly talking about food; the risks of eating certain foods, the importance of getting enough protein and they only shopped at the health food store. Taking this at face value it would appear that these volunteers were being health conscious and understood the importance of eating good nutritious food. However, Ingrid pointed out that the way the volunteers talked and behaved with regards to their food was obsessive. Food would be the topic of conversation whilst sitting around the dinner table and it was like they were not able to enjoy the food that they were eating as they were constantly questioning it. She inferred that the relationship they had was actually a form of control. Ingrid couldn't have spoken to me for more than two minutes, but what she was saying must have really resonated as I broke down. It seems paradoxical, but deep down I knew that I had an unhealthy relationship with food, even though I was trying to eat really healthily. As Ingrid spoke about the other volunteers, I realised that she was talking to me, about me. I had developed an obsessive and controlling relationship, which was heavy to realise and hear. Two days after my meltdown I ate bread for breakfast, cake for lunch and pancakes for dinner - all diets went out of the window! Needless to say I was really bloated by the end of the day, but surprisingly (for me anyway) I was also really emotional whilst I was eating the meals. To me this further confirmed that this relationship with food was obsessive. Why would I have a rush of emotions for eating a piece of cake? Rationally, I know that one piece of cake in the whole spectrum of having not had cake for over a year is really not going to do any major damage and so where was the emotion coming from? Will I continue to be gluten-free or not? I am really struggling with this question and so far have written, and deleted, a few conclusions that are, of course, all contradictory. It appears that there is a battle going on between mind and spirit, being played out with my body and I attribute this to my food intake. So since I have started eating wheat again I am not sleeping properly and I have broken out with a spot. My head is telling me "look at what this is doing to your body- just look". I know I could stop eating wheat again, but my gut (soul, subconscious, spirit - whatever you call this) is telling me that there is something wrong with this food obsession and I know that I need to trust her as controlling my food intake does not make me happy. I have talked about food in this article, but it can be applied to other things as well. If we have to do something, anything, whether it concerns food, fitness, yoga or even meditation, to feel good then it might be time to reflect as to why you are doing it. I felt emotional about eating a piece of bread and so had to question where this was coming from and why I was letting it control my life. War ein schöner Tag gestern. Wir hoffen unseren "kleinen" Gästen hat der Kindertag im Schloss auch gefallen! Great day yesterday. We hope our "little" guests also had fun on Children's Day at the castle! What is awareness? One of the questions we asked ourselves here at Schochwitz castle the other day. With so many people here (we recently welcomed another volunteer from Argentina) there are a lot of opportunities to learn new things and explore different points of view. One of the areas where we have been able to explore many different points of view, for example, is on the meaning of 'good housekeeping'; and one of the lessons we have learnt is that the more people we are, the less efficiently anything gets done. Why is this? For one thing, no one is too sure what anyone else is up to: has someone taken care of the washing, am I supposed to be cleaning that room, and who has moved the vacuum cleaner? Needless to say the confusion has caused a lot of fun. And this is where awareness comes in. Awareness is a word that gets used in a variety of situations - 'show awareness of peoples feelings', 'they displayed political and environmental awareness', 'you have no awareness of your surroundings' - but for me it means being conscious of your environment, and how you can impact on it. If we had been more aware, we would have seen the work the others were doing, and we would have known how to do it when they didn't; We would have seen that some people were doing more housework than others, and we would have taken our turn - or we would have seen that someone always misses a certain area and reminded them to do it; we would have gained a wider view of how life in the castle is run, and also have a better idea of how we can help out and fit in. Obviously we all now have complete awareness of what is going on around us, and no longer have any problems what so ever. But because this lesson benefited us so much, we thought we might share it with you too. Let's all try to be a little more aware. It's sunny again at Schochwitz, and a good start to the weekend: we have the most guests we've had with this year's volunteers. It's also been a day full of new lessons. One of the lessons we learnt today - in the form of one of Lord Jimmy's little stories - was the following. I hope you enjoy it as much as we did. A monk who wished to see a vision of Buddha hid himself away in a cave to meditate. 20 years later, he returned unsuccessful. Thinking that he had not tried hard enough, he went back to the cave and meditated 20 years more. The second time he emerged, he was still unsuccessful: he had failed once again to see Buddha, and enlightenment eluded him. Believing he had not sacrificed enough, he returned a third time to the cave. This time, after only 5 years, he emerged once again. He had spent most of his life meditating in a cave, and was no closer to reaching enlightenment. It seemed he would never fulfill his wish. Walking down from the cave, he came across an injured dog, lying on the ground with his cuts full of dirt and maggots. Overcome by compassion he knelt down in the dirt next to the dog and began clearing it's wounds. When the job was done, and he had picked the last maggot from the cut, he looked up to see a vision of the Buddha standing before him, and finally he achieved enlightenment: you can try all your life and fail to achieve what you want, but if you dedicate yourself to doing something from the heart, then you will get what you need. Another rainy day at castle Schochwitz and our new plants are loving it! We welcomed our 6th volunteer yesterday - an Argentinian. We now have people representing 6 different nationalities living and working in the castle. That means 6 different languages, 6 different cultures, 6 different ways of doing things and seeing things. Needless to say, sometimes all of these differences can cause a lot of confusion - like the other day when half of us thought we were supposed to open the Cafe and the rest had gone to the kitchen to prepare the coffee. The kitchen is also a place of much eventfulness and fun. With so many different culinary traditions and levels of ability mixed into a single place, every meal turns into a game of pot luck. Sometimes someone will whip something up in mere minutes and astound us all with their edible masterpieces, other times people will disappear for days on end into the dark confines of the kitchen and emerge with something - well, it can be interesting to say the least. We have had everything from absolutely delicious to the kind of dish where the politest response is to refrain from asking whether it's edible. But every day is a new discovery and life goes on in Schloss Schochwitz. We at the Schochwitz Healing Castle are interested in meeting those who wish to grow spiritually. Please come visit us in East Germany.